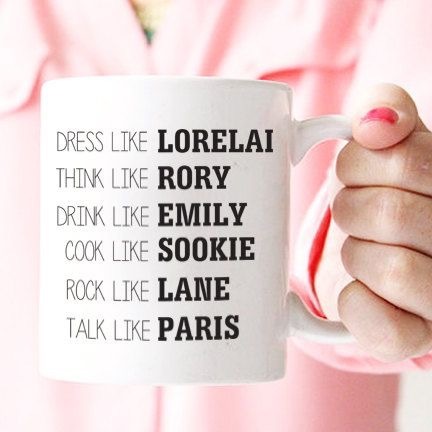 The other day a friend posted this photo on my Facebook timeline and my first thought was how cool it would be to live your life channeling a little bit of each of these amazing characters from Gilmore Girls. (Okay, it wasn’t my first thought. My first thought was, “I have to buy this!” but close enough.) While I believe this mug captured memorable traits from each role, there were definitely a few essentials missing. Granted slapping this stuff on a mug requires brevity, but I’m a writer—and we tend to be wordy—so I thought I might share some of my own favorite things about this lovable cast. Are you ready for the breakdown? Here we go! Lorelai: I always had great appreciation for her wardrobe (nobody could rock high-heeled boots like her! ), but she really captured my heart with her signature wit and her truly astounding ability to deliver an enormous amount of dialogue seemingly without drawing breath. She may have been impulsive and oh so impatient, but she balanced this nicely with her captivating smile and huge heart. Not to mention her capacity to put away copious amounts of junk food without any physical evidence. That being said, I want to dress, talk and eat like Lorelai. Rory: Without a doubt the most well-read and smartest one on the list (she did beat out Paris for valedictorian after all), she also possessed the sweetest disposition known to man. Everyone—with the exception of Dean’s wife and an angry ballet dancer—loved Rory. She was also quite witty (inherited from her mother, natch), using her intellectual prowess to take her humor to a whole other level. If I had the chance, I would think, read and sparkle like Rory. Emily: She clearly knew her way around a good cocktail, but she was also no slouch in the etiquette department. (Perhaps she felt the need to live up to good old Emily Post!) She may have been tough as nails, but she was graceful, determined and had amazing taste in jewelry. And that voice? So regal and imposing. I totally want to drink, take charge and enunciate like Emily. Sookie: Though well known as the originator of the most delicious food in Stars Hollow and beyond (I can’t tell you how many times I wanted to reach through my TV to taste what she was making), it was her sunny demeanor that always stuck with me. From her infectious laugh to her hair-brained schemes, watching her on screen always made me smile. She was positively brimming with silliness, enthusiasm and love. If I could, I would love to cook, laugh and enthuse like Sookie. Lane: The coolest chick around, she was adept at living a double life. Ever the dutiful daughter, she presented the perfect image to her domineering mother while she followed her love of rock, junk food and pop culture in private. She was dramatic, soulful and passionate about her music. It would be awesome to rock, feel and dream like Lane. Paris: She was definitely no slouch in the dialogue department. Not only did she offer up some of the sauciest zingers ever written, she would make you cry with laughter from her deadpan delivery. She always overstepped, she gave an impeccable withering stare and she never took crap from anyone. She was, without a doubt, stark raving mad and absolutely hilarious. Given the opportunity, I would talk, stare and reduce people to puddles like Paris. That does it for my take on these amazing Gilmore Girls personalities. Although, I do have one more thing for you. Here’s my take on a few other Stars Hollow favorites in convenient mug-sized descriptions. Enjoy!